Karen Burns-Booth serves up some tempting, and very simple, Christmas morning breakfast snacks in the form of these coffee and pecan muffins. You can prepare the ingredients the night before to save time, if preferred. You know how frantic things can be on Christmas morning, all the frenzied unwrapping of presents by the little ones and the last minute peeling of potatoes as well as preparing the sprouts. Well, today’s recipe for Christmas morning coffee and pecan crumble muffins are an absolute godsend! These muffins can be made weeks in advance before being frozen and defrosted overnight, and then all you have to do is pop them in a warm oven to serve them on Christmas morning. I love the classic Christmas breakfast of smoked salmon with scrambled eggs, but there is something rather indulgent about these coffee and chocolate flavoured muffins with their crunchy pecan crumble topping, and they are just perfect with a cup of coffee too. If you do have time to make them in the morning, to get ahead you can weigh all the ingredients out the night before and make the crumble topping too. Serve these muffins warm with a pot of coffee and watch them disappear off the table in a trice – if you are worried about the caffeine, then just use decaffeinated coffee in the recipe, there will be no difference in the taste. I added a little natural red food colouring in mine to given them a lovely festive red colour, similar to red velvet cakes, but this is completely optional. It is a nice idea to serve them in red or green paper muffin cases though, for a bit of Christmas dressing! 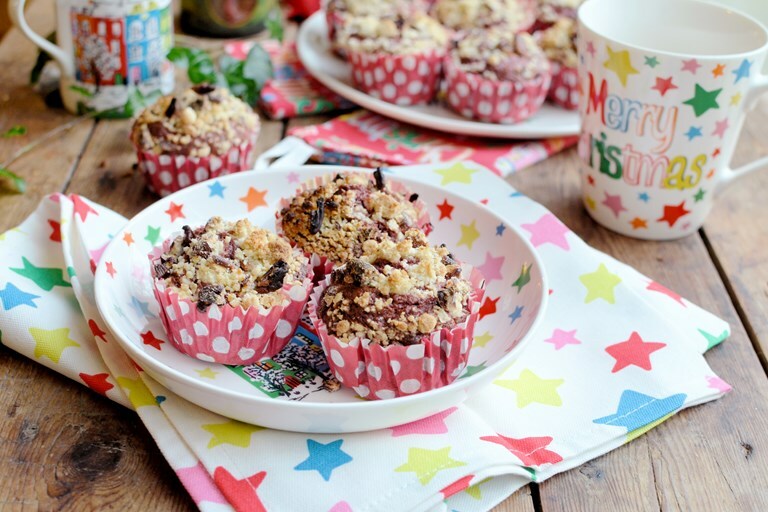 The recipe for these Christmas morning coffee and pecan crumble muffins is below, and all that remains for me to say, is have a very merry Christmas and a happy New Year!